Big Red Tomato soup is the best tasting soup on the market, it is also great for making spaghetti adding some to stews and casseroles for something extra. Heinz Big Red Tomato Soup has been around for years so this tells you the quality of the product. The ingredients have never changed. Spaghetti sauce is the best way to get the freshness out of this product. Rich taste love the spices. This is great to have in the kitchen for when you need a quick dinner. And Miss 7 loves it. 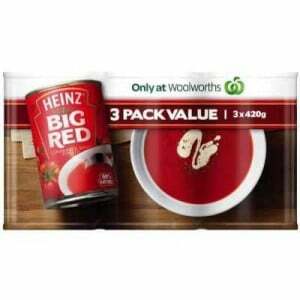 Heinz Big Red Tomato Soup is an all time favourite tomato soup. I love this soup served with a sprinkle of cheese and with toast. How would you rate Heinz Canned Soup Big Red Tomato?